October 25, 2017 in Star Wars Wed. Ghosts of Dathomir is out, so some GMs and players are (hopefully) planning their new campaigns, or integrating the adventure into their current stories. This post has a few resources that both may find useful to their new campaign. It has some very minor spoilers - not more than what you might learn reading the back cover of the book. September 14, 2016 in Star Wars Wed. So, it turns out that after a month of different conventions, I guess I just needed some time away from the blog. Or was tired. Or something. 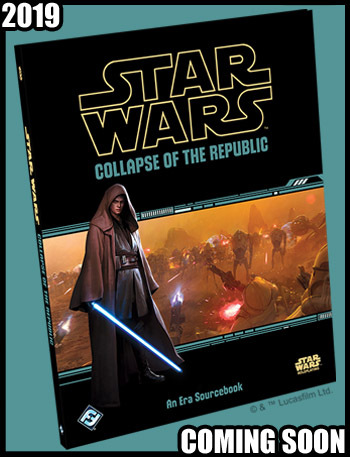 In any case, Star Wars Age of Rebellion Forged in Battle hit store shelves after debuting at Gen Con. I had a hand in it, so it's probably time to talk a bit more about that, now that it's out. March 09, 2016 in Star Wars Wed. It is always interesting to see how a product I've worked on fits into the ever developing Star Wars universe. Nexus of Power for Force and Destiny is now listed as shipping on the FFG website, meaning it will be arriving relatively soon. Actually, Special Modifications for Edge of the Empire is also about to arrive, but that's another story. I'm going to touch on recent Rebels episodes, so spoiler alert. 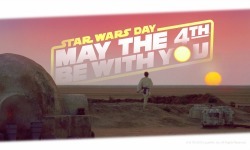 May 06, 2015 in Conventions, Star Wars Wed.
Monday was the increasingly popular Star Wars day, or May the Fourth Be with You. I tend to think a day later in May is more suitable, but a terrible pun is amusing and memorable, so most seem to be running with it. Sometimes, it seems like everyone is trying to get in on the action - a point made on Monday's @midnight show on Comedy Central. Lots of deals and a few really good announcements. And Celebration news and stories keep surfacing, especially now that more videos are hitting the internet. February 25, 2015 in Star Wars Wed.
Star Wars Edge of the Empire Lords of Nal Hutta has been out for a bit now. Here are a few thoughts on my section, which is essentially the first chapter. January 07, 2015 in Star Wars Wed.
With the holidays, and New Years Eve falling on Wednesday, I didn't get around to a last grab bag post of the year this time. I am trying to kick off 2015 on schedule, though. We'll see how long that lasts. 2014 was a great year for Star Wars, and 2015 appears to be even better. It got off to a great start with the return of Star Wars Rebels, and one of the best episodes yet. Even better, it opens up some new ideas for the RPG. Spoiler warning for the episode on this one - but I'm putting those observations at the very end of this entry with a wide gap in between so those that don't want to see it can read the rest of the post. Things like a few comments on Stay on Target. Happy New Year! December 17, 2014 in Star Wars Wed.
October 03, 2014 in Star Wars Wed. This week's excuse for a late post is pretty good...my local MLB team, the Kansas City Royals, made the postseason for the first time in 29 years. Its more than a bit distracting at the moment - and they are winning so far, and had a weird but awesome game to start it all off. I thought about skipping the post at this point, but it's the debut of Star Wars Rebels tonight, and as you may have guessed, I am already a big fan of the show. So here are another quick few items that I would have normally expanded on. August 27, 2014 in Star Wars Wed.
Work travel has me out and about this week, so here's a few short items for now....On the plus side, it should show up first thing Wednesday instead of the last thing. Star Wars Wednesday - We're All Fine Here. How Are You? July 16, 2014 in Star Wars Wed.
March 12, 2014 in Star Wars Wed. Since The Clone Wars Lost Missions came out over the weekend, here are a few comments and notes on things along the way. No spoilers, though. And a few other items that got pushed aside in the past few weeks for more important posts. February 26, 2014 in Star Wars Wed.
October 16, 2013 in Star Wars Wed.
October 10, 2013 in Star Wars Wed.
March 27, 2013 in Conventions, Star Wars Wed.
March 20, 2013 in Conventions, Star Wars Wed.
Another busy time, so, Ready! Set! Go!.